I would need to spend more time reading it, but Pound's "I Vecchii" seems to lament the type of art that has to be filtered through censorship. His poem opens, "They will come no more, / The old men with beautiful manners." One speaker says, "Oh! Abelard," possibly alluding to Pierre Abelard who had a famous love affair with Heloise (according to Wikipedia—this allusion possibly arises in other parts of this poem). This speaker, however, ends abruptly "as if the topic / Were much too abstruse for his comprehension." Pound ends his poem by evoking Voltaire as a figure of free speech. Searching for "Censorship" through the tag filter lend me to and advertisement in The New Freewoman called "To Overmen." This advertisement calls for "Brave Men and Women of independent means" to join an expedition to discover and colonize a state free of censorship. These works are linked by their shared interest in censorship. The advertisement mentions colonization, which was likely a problematic term for Pound. Pound's use of multiple languages suggests an antinational form that incorporates differences instead of focusing on boundaries, which colonization suggests. Searching the timeline for Pound's other work yields mostly his criticism. One of his works, "The Revolt of Intelligence," criticizes journalism. He argues that journalist set up the appearance (and pretension) of knowing every topic they must cover from Monday to Saturday. As a foil to journalism, which focuses only on the daily events, literature is "concerned with the permanent elements of life; it often bridges the gap from the profound to the trivial by contemporaneous detail." Literature, according to Pound, is superior to journalism because it consumes journalism (the "trivial" and "contemporaneous") and connects it to something significant. When I used the genre filter and magazine filter on the timeline, I found that most of the content related to World War I. The items cataloged in the timeline have titles like "Fatigue," "Youth and Age," "The Veteran," "Senility," "Decay," and "Whispers of Immortality." Even if these works do not address the war directly, they indirectly suggest a thematic link through topics of death and decay. Using the last two filters suggests that Pound avoided discussing the war (according to our timeline data). The largest drawback of the timeline is that it is incomplete. If it were near-complete, it would be very useful for researching a specific time period in a magazine's or author's publication. The keywords makes it easy to expand and contract the research field according to my own interests. It also helps to historicize works by showing what else is going on in the magazine's publishing run or the author's other works. The timeline has started to help me make connections with Pound's interest in censorship and literature and other contemporaneous works discussing similar topics. It seems your attempts to find content related to the topics of censorship and journalism were pretty successful. 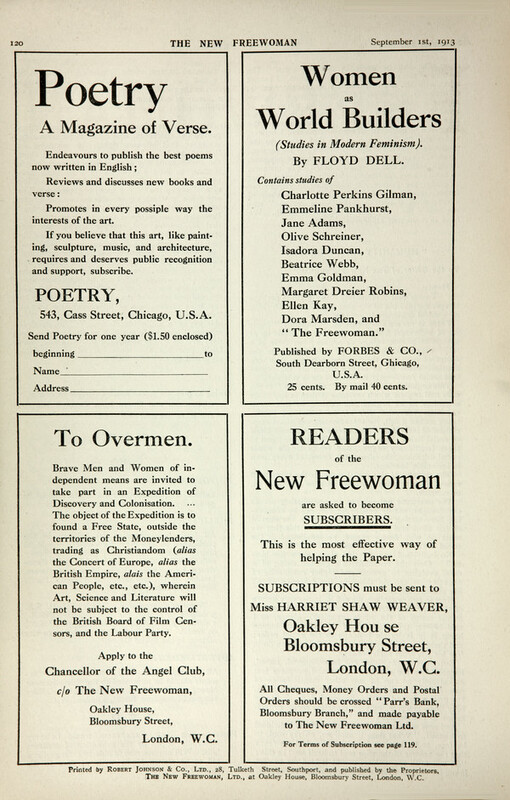 Much of Pound's writing -- and indeed much of the writing in The Little Review and its sister magazines started by Dora Marsden, The Freewoman, The New Freewoman, and The Egoist -- was concerned with the truth value of language. He and most of the other modernists held that the ideology supported by mainstream media, especially journalism, amounted to censorship that had a trickle-down effect on the deterioriation of the individual mind. Pound and many other modernists were obsessed with the idea of permanence in literature, that it should connect with something larger than self or nation, which would not be possible with censorship. But you and Clint are right, the timeline is incomplete and biased toward whatever interests have been held by its shifting and impermanent contributorship. Today we'll look at possible ways to work with or remedy this.